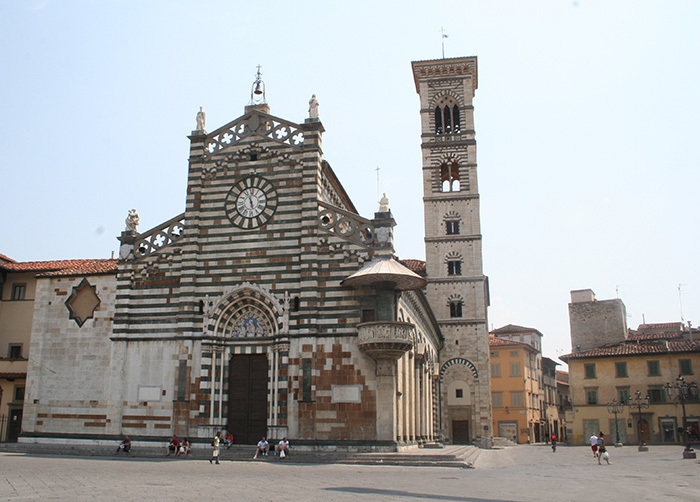 Prato Cathedral or Cattedrale di San Stefan is the main Roman church of Prato. The Duomo is dedicated to Saint Stephen, the first Christian martyr. It is one of the most ancient churches in the city, and was already in existence in the 10th century. It was built in several successive stages in the Romanesque style. The church contains a number of notable works of art, in particular fine sculpture. Inside the church on the left is the Cappella della Cintola (Chapel of the Sacred Girdle), entirely frescoed (1392-95) by Agnolo Gaddi. 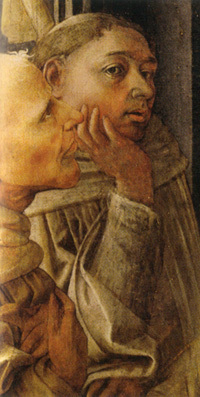 Fra Filippo began to fresco the enormous choir of the Cathedral of Prato in 1452 (after Fra Angelico had turned down the assignment). He was aided by his chief assistant of the period, Fra Diamante; the work dragged on for years. As a fresco painter Lippi's finest achievement is this cycle on the lives of Sts Stephen and John the Baptist (1452-65). In Prato Lippi also obtained a number of other assignments and purchased a house there in 1455. He is nominated chaplain in the nunnery of Santa Margherita in Prato. The church of Saint Stephen was built in a green meadow (Prato) after an appearance of the Virgin Mary near the village of Borgo al Cornio (the present center of Prato). The first building was a small parish church. which the earliest document dates from AD 994. The expansion of the church began in the 15th century and transformed the modest building into one of the most lovely Gothic-Romanesque buildings in Tuscany. The cathedral is documented as early as the 10th century as the Pieve di Santo Stefano, located in the Borgo al Cornio, the first settlement in Prato. The current structure dates from the Romanesque period of the 12th century: the nave, side walls and greater part of the bell tower remain from this date. The upper stage of the bell tower was constructed in 1356. During the 14th century the cathedral acquired an important relic, the Sacra Cintola or Belt of the Holy Virgin. This brought about the enlargement of the edifice by the addition of a transept which is attributed to Giovanni Pisano, but is probably the work of a pupil of Nicola Pisano. The Cintola Chapel was also built at this time to house the relic. In the early 15th century, a new façade or west front was added in the International Gothic style, in front of the old one. In the space between the two was created a narthex or corridor leading to the external pulpit, built by Michelozzo and decorated by Donatello between 1428 and 1438. The façade is architecturally simple, the shape of the building informing the new structure so that its low-pitched central roof and sloping side aisles mark the roofline, which is enlivened with an open parapet of simple Gothic tracery, uniting the building with the sky. The façade is divided into three sections by shallow buttresses or pilasters. That part above the springing of the door arch is faced with marble in bold contrasting stripes, while the lower part is pale-coloured but much stained in some areas, possibly from the absorption of pollutants. The façade has a single central portal with a lintelled doorway surmounted by a Gothic arch. In the lunette over the door is a glazed terracotta sculpture by Andrea della Robbia depicting the Madonna with Saints Stephen and John. The frescoes of the transept chapel are also of the 15th century, but are in the Renaissance painting style. Internally, the church, built on a Latin cross ground plan, has a nave and two side aisles, all in Romanesque style and dating from the early 13th century. They are separated by elegant columns of green serpentine, the capitals being attributed to Guidetto. The vaults, designed by Ferdinando Tacca, were added in the 17th century. The north aisle houses a notable Renaissance pulpit in white marble (1469–1473). The base is decorated with sphinxes. 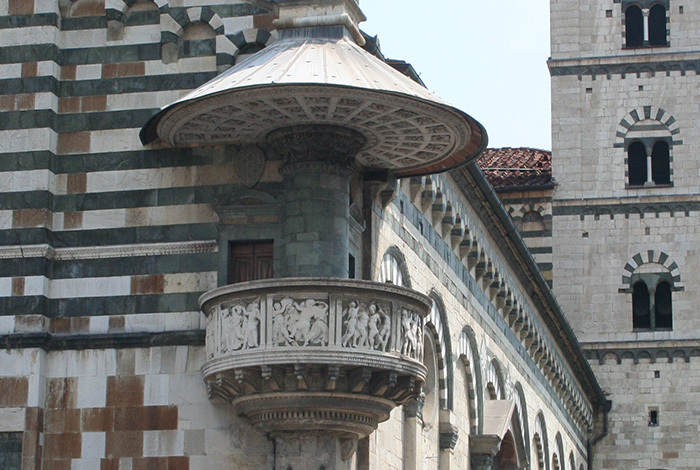 The parapet has reliefs by Antonio Rossellino, portraying the Assumption and the Stories of St. Stephen, and by Mino da Fiesole portraying the Stories of St. John the Baptist. It is faced, in the opposite aisle, by a great bronze candelabrum by Maso di Bartolomeo (1440), having an elongated vase-shape from which seven branches protrude. Maso also executed the balcony of the inner west wall, which in addition is decorated with a fresco of the Assumption by David and Ridolfo del Ghirlandaio. A small staircase leads from the old church to the 14th-century transept, which has five high cross vaults, each ending in an apse divided by pilasters. The presbytery has three works by the American artist Robert Morris (2000–2001). In the south arm of the transept is the Renaissance tabernacle by the Da Maiano brothers: the Madonna with Child terracotta (1480) is by the more famous Benedetto. The chapels can be accessed through a 17th-century balustrade in polychrome marble, for which parts of the Renaissance choir were re-used (including crests and cherubims). In the south arm of the transept, the Vinaccesi Chapel houses a notable Deposition of Christ from the 13th century. It also has 19th-century frescoes by the Pratese painter Alessandro Franchi. Next is the Assumption Chapel, which was frescoed in 1435-1436 by the so-called Master of Prato and by a young Paolo Uccello, who painted the Stories of the Virgin and St. Stephen, completed by Andrea di Giusto in the lower section. They show a bizarre fantasy of enchanted figures caught in a wide range of brilliant colors, and surrounded by Brunelleschi-like architectures. In the main chapel, or chancel, Filippo Lippi and Fra Diamante painted the Stories of St. Stephen and St. John the Baptist. The frescoes in the choir of the Cathedral in Prato represent a long drawn-out but major effort by the master, and they seem to have been produced slowly and sporadically between 1452 and 1466. The enormous scale of the choir and consequently the painted subjects, a far cry from the intimate frescoes of the Brancacci Chapel, must be taken into account for an effective evaluation. The cycle has been restored recently, revealing powerful yet sensitive images produced with verve and facility during a late period in Lippi's development. The Prato frescoes were both an artistic and a physical challenge for the aging painter, and, particularly in the large scenes on either side of the choir with stories of St John the Baptist and St Stephen, an ample share of the execution may be attributed to workshop assistants. On the lower north wall are depicted the Obsequies of St. Stephen, in which Lippi portrayed Pope Pius II, set in a Palaeo-Christian basilica, as an imposing figure in scarlet costume. On the right is the artist's self-portrait. On the opposite wall is Herod's Banquet, showing a large hall in which Salome is performing her ballet, and the handing over of the head of John the Baptist to Herodias. The altar is by Ferdinando Tacca (1653). The Manassei Chapel was frescoed by a pupil of Agnolo Gaddi in the early 15th century with Stories of St. Margaret and St. James. The last chapel on the left, the Chapel of the Inghirami, houses a funerary monument attributed to Benedetto da Maiano and a stained glass window from the early 16th century. The Cintola Chapel or Cappella del Sacro Cingolo, is located under the last arch of the north aisle, next to the counter-façade. It houses the Sacra Cintola or Girdle of Thomas, the belt which, according to the tradition, was given to Saint Thomas by the Virgin Mary during the Assumption. It was brought to Prato in the 13th century. The chapel has frescoes of Stories of the Virgin and the Cintola by Agnolo Gaddi (1392–1395), which are notable for their luminous colors. Also noteworthy is the panorama of Prato in the Michael's Return scene. The 18th-century altar, which encloses the Cintola, is crowned by a marble Madonna with Child (c. 1301), and is considered one of Giovanni Pisano's masterpieces. The Prato relic is kept in a reliquary in the Cappella del Sacro Cingolo in Prato Cathedral, and still exhibited five times annually, on the birthday of the Virgin Mary on September 8 and other feast days. In the Middle Ages the display coincided with the three days of the Prato (trading) fair, and was accompanied by elaborate civic ceremonies and festivities. After 1348, matters relating to the relic were controlled by the Opera del Sacro Cingolo, a four man lay body elected by the city council, who retained one third of the revenues collected from the pilgrims to the relic to fund their work. Following an attempted theft in 1312 and growing numbers of pilgrims, the city decided they needed to build a new chapel for the cathedral to hold the relic, which was previously kept in the cathedral choir. The new chapel is at the west end of the left aisle, near the main door. It begins with a screened-off area under the first arch of the nave, but extends back into a new section built out of the side wall of the cathedral. Completing the chapel took the rest of the century, and the girdle was finally installed on Easter Sunday in 1395. The chapel has frescoes of Stories of the Virgin and the Cintola by Agnolo Gaddi (1392–1395). The 18th-century altar, which encloses the Cintola, is crowned by a marble Madonna with Child (c. 1301), considered one of Giovanni Pisano's masterpieces. Presumably because the Prato relic has always been kept folded in a reliquary, and there are many rival relics, it is noticeable that the Tuscan artists depicting it cannot agree as to its precise form, but several knots along its length and tasselled or divided ends are common features. Two successive pulpits for the public display of the relic in Prato were built, the first was apparently inside the cathedral and is now gone, but was probably decorated with the 14th century reliefs now in the cathedral museum. 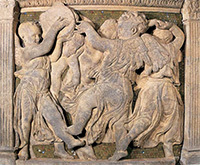 The second was built outside, projecting from a corner of the cathedral, in the 1430s by Donatello and Michelozzo, with a relief frieze of putti. This is very high, and does not allow a close view of the relic when it is displayed. This pulpit is still used today, though the rather worn original reliefs have been moved to the museum and replaced by copies. The museum also has the reliquary by Maso di Bartolomeo of 1446-47, decorated with putti' matching the outside pulpit; he also made the very fine Renaissance metalwork screens closing off two sides of the Cintola chapel from the aisle, which were partly paid for by the Medici. A later glass and metal reliquary now houses the relic. The main pulpit inside the cathedral, for normal preaching, is decorated with reliefs by Donatello's pupil Antonio Rossellino and Mino da Fiesole and was completed in 1473. The central relief panel is a Madonna della Cintola. The main altarpiece of the cathedral, installed in 1338, had been the same scene, probably by Bernardo Daddi, from which the main panel is now lost, and the cathedral still contains other painted and terracotta relief representations by Ridolfo Ghirlandaio and others. Francesco di Marco Datini, one of the cleverest merchants in fourteenth-century Europe, built his palace in 1383, on his return from Avignon. At the time, it was Prato’s richest and most original house; so famous that the city council used to host its prestigious guests there. After Francesco’s death in 1410, the charitable institution he founded, called Il Ceppo Nuovo, commissioned the frescoing of the outside walls of the building, with sixteen scenes from the life of Datini, presenting the merchant as an example of virtue and of industriousness. Among the most beautiful rooms of the palace stand the Audience Hall, with a splendid vault and Early Renaissance lunettes with forests and hunting scenes, and the ‘Hall of Writing’, whose decoration depicts a dense forest full of wild animals and rare plants. From the outdoor pictorial cycle, only the fragmentary sinopias of ten frames remain, preserved, whose originals are preserved in the State Archives, on the first floor of the building, which also houses the precious Datini Archives: the most important collection of fourteenth-century trade documents in Europe. The Count of Monte Cristo. Today you need a permit and your own boat to visit the island. This article incorporates material from the Wikipedia articles Prato Cathedral published under the GNU Free Documentation License. Wikimedia Commons has media related toPrato Cathedral and Antonello da Messina.